I know. Now that it’s 2005, “Arcade Fire” is a bad word or something. “I would have thought it would be obvious that the Arcade Fire never released a Christmas EP. Particularly since neither Regine or I are singing on the songs Pirchfork reviewed. But I guess the un-researched written word works Christmas miracles…I guess a tape recording of our friends making up funny songs at our Christmas party in 2002 is worthy of being reviewed, even though Tim, Richard, Howard, Jeremy, Sarah, and Will weren’t even there. I still stand by Josh’s rendition of O Holy Night as very funny, and Brendan singing Chestnuts Roasting on an Open Fire is genius. 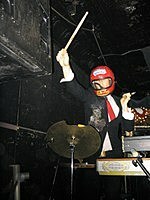 Here’s a link to a teeny tiny streaming Arcade Fire video from their July 28th, 2004 show at Local 506. You might have seen it already since Daily Refill posted it last year. More Cowbell alerted me to a stream of their appearance on NPR yesterday. Also from More Cowbell (who’s been locked away in seclusion working hard on his forthcoming Arcade Fire fan site. Stay Tuned…) are details of the/an opener on the upcoming tour. It’s Final Fantasy aka Owen Pallett playing violin. Name Ring a bell? He’s the one who covered Joanna Newsom’s Peach Plum Pear. As everyone in NYC knows, the two upcoming shows here are sold out. Tale of Two Cities breaks down the scalping scene. Those not in to scalping, can always try to win their tickets. Contests are popping up everywhere. Maybe even I’ll throw one. Until then, you’ve got Youngna, Daily Refill, and Oh My Rockness all giving you a chance to win. Finally, Chart Attack informs Canadians of all this success they’re having down here. Photos in this post also from More Cowbell. Gallery Here.